The power of words. The power of the people. Real democracy now. Remember, remember the Fifth of November. Also in 2012! Don’t underestimate the power of words. Don’t underestimate the power of symbols. Don’t underestimate the power of the people. Print out a text for real democracy. And on Monday, November 5, 2012, show it visibly wherever you are. Only a couple of hours left till the fifth of November 2011, the first #PowerOfWordsDay. Twitter or post about what you are doing or did on the fifth of November. Or post it in this posting below as a comment, or on our Facebook page. Remember this idea and this page for 2012. We are going to do this again on the fifth of November 2012, obviously with almost one year more time to organize for us all, so together we’ll reach even more people worldwide in 2012. 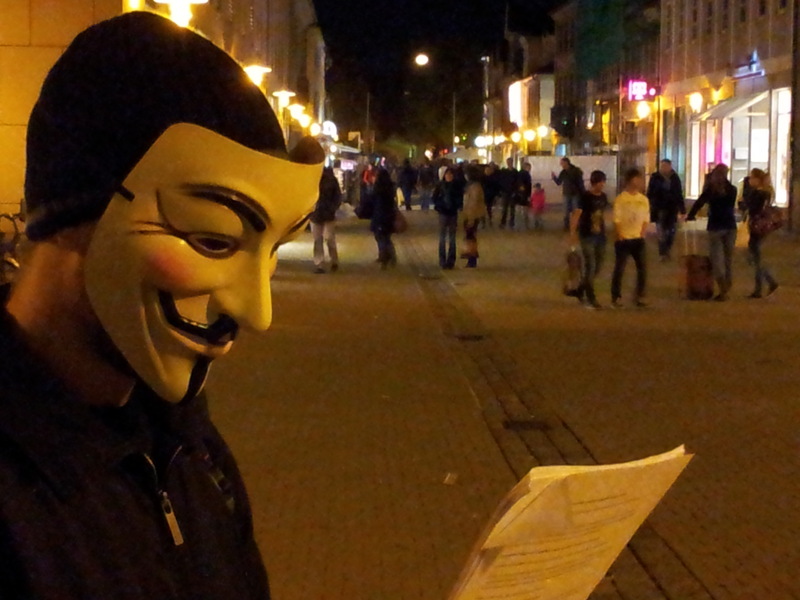 Fifth of November, 16-18 o’clock (4pm-6pm), Hugenottenplatz, Erlangen, Germany. Details in this posting on their homepage. The power of words. The power of symbols. The power of the people. Because while the truncheon may be used in lieu of conversation, words will always retain their power. Unterschätze nicht die Macht von Worten. Unterschätze nicht die Macht von Symbolen. Unterschätze nicht die Macht der Menschen.